C. A. Robinson & Co.
As you walk west along the riverfront from the O2 towards Ballast Quay, you come to Enderby Wharf and there you will see, on a jetty, a grey steel tower and a grey wheel engine. These were used for loading submarine cable from the adjacent factory to cableships moored in the River Thames. They are the last remaining symbols of a 125 year period when Britain led the world in submarine cable manufacture – where the River Thames and in particular the Greenwich Peninsula was the ‘silicon valley’ of its time. Submarine telegraph cable was manufactured on the banks of the River Thames by four companies. These were: the India Rubber, Gutta Percha and Telegraph Works Company (1864-1922) at Silvertown; Siemens Brothers (1863-1935) at Charlton; W T Henley Telegraph Works (1857-1900) at North Woolwich and the industry’s leading supplier, the Telegraph Construction and Maintenance Company (known as Telcon). 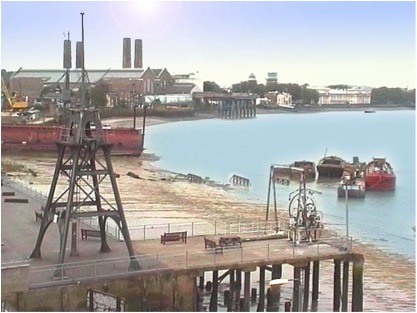 Telcon with its predecessors and successors manufactured submarine cable on the Morden Wharf and Enderby Wharf sites from 1851 until 1975. 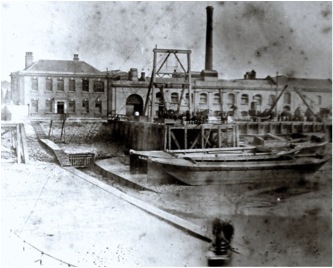 The manufacture of submarine cable first came to the Greenwich Peninsula in 1851, when the iron rope maker, W Küper and Company, expanded its business from its base on the Grand Surrey Canal in Camberwell to a site at Morden Wharf. This company was awarded a small contract for the armouring of a section of cable that formed part of the first commercially successful submarine telegraph cable, installed across the English Channel in October 1851. It was Küper’s chief accountant, Richard Atwood Glass (1820-73), who saw the potential of this new business stream and he convinced the company’s owner, George Elliot (1814-93), that there was money to be made from armouring submarine cables. Glass was proved right and in 1854, Elliot took him into partnership forming Glass, Elliot and Company. 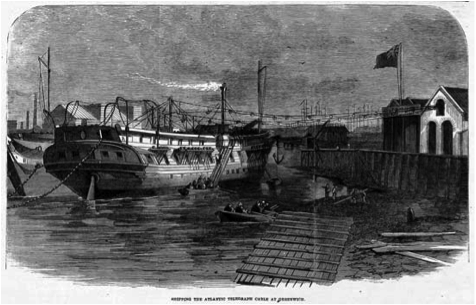 The company secured a number of contracts and in June of that year, the first ship to be loaded with cable on the River Thames at Morden Wharf was captured by The Illustrated London News. The cable was for a Mediterranean system being promoted by the brothers responsible for the 1851 channel cable, John Watkins Brett (1805-63), and his younger brother Jacob (1808-93). As can be seen, a temporary jetty was made from planks on top of barges and the cable was hauled by hand from the factory onto the ship. The submarine cable business grew quickly and soon Glass Elliot and Co. needed larger premises. In 1857, they purchased the derelict Enderby hemp and rope works, next door to their existing factory. The main reason for this expansion was that in December 1856, Glass, Elliot had been awarded a contract to armour 1,250 nautical miles (nm) of copper core coated in gutta percha for the Atlantic Telegraph Company. The cable manufacture was completed by 6 July and the British Admiralty made available HMS Agamemnon for the laying operation. 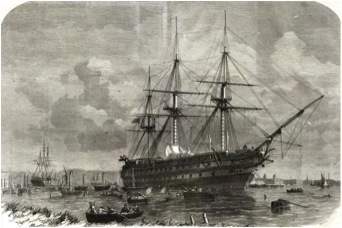 She was the first vessel to be loaded from the Enderby Wharf facilities and once again it was captured by The Illustrated News. As can be seen, the loading method was modified to accommodate the larger ship; the cable pathway comprised a series of towers mounted on separate barges, each tower having a pulley or roller on top with the cable suspended between them. Once again, manual hauling was the motive force used to drag the cable from the factory. The 1857 and 1858 attempts to lay a cable across the Atlantic were not successful and the industry went into a period of investigation and development. Once again, it was Glass who had the vision to see that a single company should be responsible for the totality of the cable manufacture and installation. However, he could not make this happen and it was left to John Pender (1816-96) to merge Glass, Elliot with the Gutta Percha Company to form the Telegraph Construction and Maintenance Company, which was formed on 7 April 1864, with Pender as its chairman. On 5 May that year, Telcon was awarded a contract to manufacture 2,700nm of cable for a new Atlantic system by the Atlantic Cable Company. 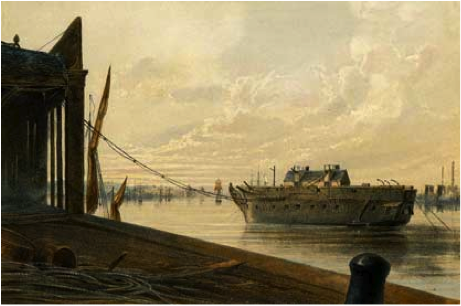 Telcon’s plan was to use the SS Great Eastern to lay the cable but she was too big to load cable from the Telcon factory as, when fully loaded, her draft would have been too great to navigate the river around Greenwich. 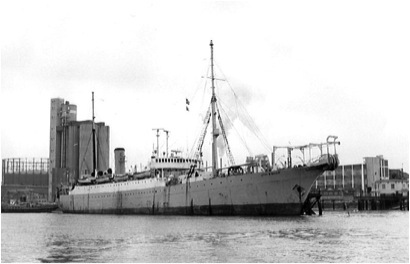 Therefore, she was moored in the Medway at Sheerness and two small converted vessels, the Amethyst and the Iris, were used to carry 150nm of cable at a time from the factory and transfer it to the Great Eastern in Sheerness. Manufacture was completed in May 1865 and the loading of the small vessels was captured by two artists. The first was an Englishman, Robert Charles Dudley (1826-1900), whose illustrations appeared in The Atlantic Telegraph, a book sponsored by Telcon and written by The Times correspondent, Irishman William Howard Russell (1820-1907). The other artist was an American, Carl Joseph Becker (1841-1910), whose illustrations appeared in Frank Leslie’s Illustrated Newspaper in the USA. 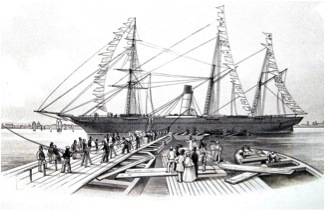 For the next ten years, the SS Great Eastern was the main cable laying ship for Telcon, so the method of transfer by small vessels was maintained. In 1874, Telcon procured its first purpose-built cable laying vessel, the Faraday (1), and decommissioned the Great Eastern. The Faraday was able to navigate the river loaded; therefore, she could load cable direct from the factory and so the method of loading was changed again. An ‘A’ frame was built on the jetty to support a steel wire catenary. The catenary was suspended between the ‘A’ frame and a stanchion on the cable ship. The wire supported a series of pulleys, called sheaves, that carried the cable from the shore to the cableship. The height of the ‘A’ frame allowed the ship to rise and fall on the tide without the cable line dragging in the water. The calculations also took into account the fact that as cable was loaded onto the vessel, the additional weight would cause the cableship to sit lower in the water. The cable was hauled from the tanks in the factory by the ship’s cable engine. Access to the ship was by rowing boat and a set of steps with a causeway was built alongside the outfall of Brandish Sluice. This allowed access to ships as the tide rose and fell. The boatman was also employed in sweeping the mud off the causeway that was deposited by the falling tide. This system can be seen in a unique picture of Enderby Wharf taken an 1886. This system remained in place for many years and a boatman was employed until the last cable was manufactured on the site in 1975. Of course, at some stage the rowing boat was replaced by a motorised launch. Early in the 20th century, three timber structures, known as dolphins, were built in the river beyond the low water mark, so that the cableships could be moored to these, without having to rely on the riverbed for anchor holding ground. The dolphins also provided power and communication cables for the cableships to connect to and utilise. By 1894, Telcon was beginning to manufacture submarine telephone cables; the Enderby Wharf Factory continued to grow but the Morden Wharf site was outdated and inefficient, and so in 1895, it was shut down. During the First World War, Telcon turned over virtually all cable manufacture to trench cables. At the end of the war, Marconi radio became a major competitor for long distance communications, both telegraph and telephone, and Telcon struggled. On 1 October 1935, Telcon merged with Siemens Brothers, its only remaining UK submarine cable manufacturing competitor, to form Submarine Cables Limited (SCL). The new company based itself at Enderby Wharf and continued making commercial cables up to the start of the Second World War. After the Second World War, transoceanic telephone cables became possible and SCL found itself the monopoly supplier of subsea cable, as the French and Japanese manufacturers’ facilities had been destroyed during the war and the USA had yet to enter the industry. The first transatlantic telephone cable was called TAT-1 and was inaugurated on 25 September 1956. The vast majority of the cable for this system was made by SCL at Enderby Wharf and its new Erith Factory. The existing gantry and cable machine was installed on the jetty in 1954 to load TAT-1 cable onto cableships. 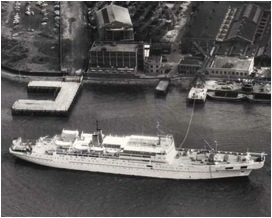 Unfortunately, there are no photographs of TAT-1 cable being loaded at Greenwich but there is an aerial shot of the C S Monarch (4) loading TAT-1 cable at SCL’s Ocean Works factory in Erith. In 1950, Standard Telephones and Cables (STC) entered the submarine cable market and in 1956, it built a new cable manufacturing facility in Southampton to compete with SCL. The success of TAT-1 convinced the British Government that it should build its own transatlantic cable to connect the UK with Canada. This was called CANTAT and the commonwealth governments soon followed suit by procuring a transpacific cable called COMPAC, and a cable network connecting the commonwealth countries in the Far East called SEACOM. The cable for these three systems was made by SCL and STC, with a high percentage being made in Greenwich. The cable line can be clearly seen running from the gantry on the jetty to the foredeck of CS Mercury. In 1970, STC took over SCL but continued to manufacture cable at Enderby Wharf until the end of 1975, when all cable manufacture was moved to STC’s Southampton factory. The last cable to be manufactured at Greenwich was for a telephone system between Port Moresby in Papua New Guinea and Cairns, Australia. The cable was loaded onto the CS John W Mackay in early 1976. The John W Mackay was built in 1922 and on her return from Australia she was retired. She spent over a decade moored on the dolphins at Greenwich. I﻿The John W Mackay was moored at Greenwich from 1977 until 1990. During this period the port side of the vessel, facing the shore, was given a major face lift and maintained in good condition. See the picture on the right from June 1983. Shortly after the ship was taken away, the dolphins were removed from the riverbed. In 1994, STC Submarine Systems was purchased by Alcatel, its French competitor, and formed Alcatel Submarine Networks (ASN). For a short time ASN continued to manufacture cable in Southampton but in 1996, the Southampton factory was closed in favour of ASN’s facility in Calais. This was then the second oldest submarine cable factory in the world, having gone into production in 1891, some 40 years after cable was first produced at Morden Wharf. With the closure of the Southampton factory, the 146 years history of submarine cable manufacture in the UK came to an end. 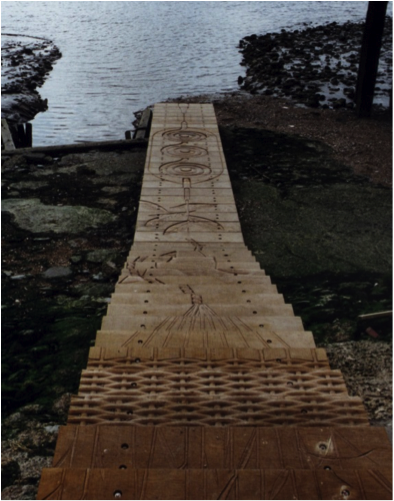 In 1999, ASN supported a project to redevelop the Enderby Wharf riverfront. 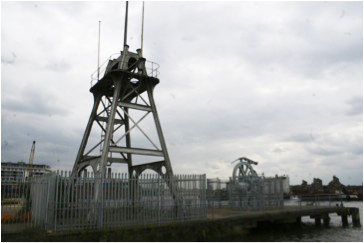 This included the development of the main Enderby Wharf jetty as a public open space with information panels, the retention of the cable winding gear, a display of a subsea repeater and seating. The adjacent Enderby steps and causeway that had been used to ferry personnel between the shore and the cable ships were restored, providing safe pedestrian access to the beach at low tide and as a visual account of the history of the industrial Greenwich Peninsula. In 2008, ASN sold the river frontage of the Enderby Wharf site to a developer, although they retain responsibility under licence to the Port of London Authority (PLA), for the two jetties and the causeway. Due to the development work and the fact that ASN no longer controlled the property next to the jetty, it was agreed with the PLA that the jetty should be closed to the public. It is understood that public access to the jetty will be reinstated once the development of the riverfront is complete but what it will be used for is, as yet, unknown. 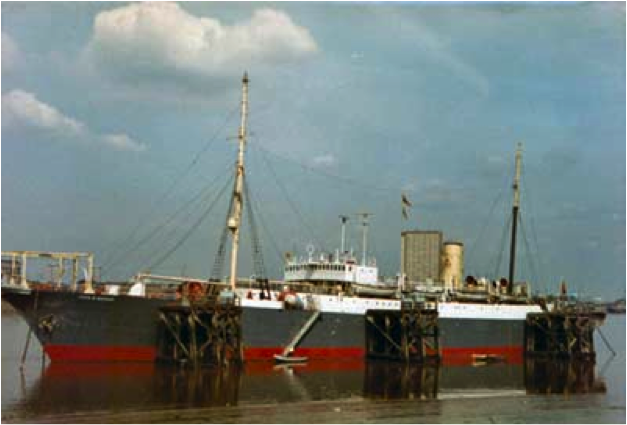 CS Monarch (4) loading at Erith in 1955.